The government information office in Gaza on Friday refuted Israeli allegations that an Israeli eight-doctor delegation arrived in Gaza ahead of expected Friday protests. Head of the office Salama Ma’rouf said in a press statement that the medical delegation is composed of Palestinian doctors coming from the 1948 occupied Palestinian territories. Ma’rouf explained that Israel’s efforts to beautify its image through “cheap propaganda” are a failed attempt to evade responsibility for all crimes committed against peaceful protesters in Gaza. 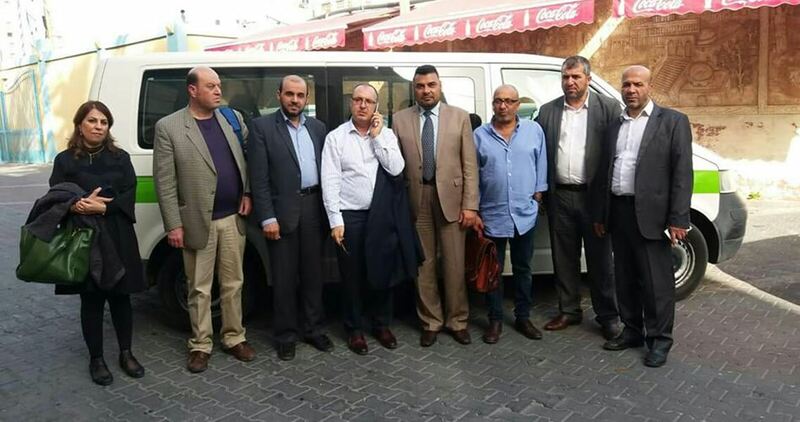 Gaza’s Ministry of Health announced that it had received a Palestinian medical delegation from Physicians for Human Rights organization headed by Dr. Salah Haj Yahya. The Ministry thanked Physicians for Human Rights for responding to its call and sending a medical delegation that would help provide treatment to Gaza-based Palestinians and offer some medical training. At least 34 Palestinians have been killed and over 3,000 injured by Israeli gunfire in the daily Return protests which started on 30th March along Gaza’s border with the 1948 occupied Palestinian territories. The International Criminal Court (ICC) is back on the scene, with more evidence that it gives Israel the benefit of the doubt. ICC Chief Prosecutor Fatou Bensouda’s statement last Sunday indicated that her office has monitored the demonstrations in Gaza which have resulted in Israel killing 29 Palestinians and wounding more than 1,600 others. There is little doubt that the ICC, like other international institutions, is competent in recording human rights violations. This is, after all, their lifeline. What happens with the evidence is another story, though, and one that has been repeated to the point of perfection. Besides Israel’s refusal to allow proper investigations to take place, there is also the context of the organisations themselves and their dependence upon the violation of human rights, which has created a vile cycle of abuse to the point of rendering humanity subjugated to the organisations’ bestowal of impunity upon the perpetrators. On Monday, Likud Spokesman Eli Hazan declared on a television programme that all 30,000 Palestinians demonstrating are legitimate targets for Israeli snipers on the borders. The statement is evidence of premeditated intent to murder and injure Palestinians who are within their right to reclaim their return to historic Palestine. According to the Jerusalem Post, Israeli Defence Minister Avigdor Lieberman has also called for human rights group B’Tselem to be investigated for calling upon soldiers to disobey illegal government orders to fire on Palestinian protestors. Like other shows of violence which put Israel under the spotlight and trigger a wave of support for Palestinians — that usually dwindles until the next planned aggression — the Great Return March’s intent has been obscured by Israel’s appropriation of terminology to legitimise its theft of Palestinian territory. Hence, the emphasis upon “borders”, which in turn elicits rhetoric such as “both sides” in official comments; both examples are used as foundations for mainstream media misinformation about purported clashes in which Palestinians simply die, rather than “have been killed by Israeli snipers”. The Great Return March is a direct result of the context in which Palestinians find themselves, which started with the colonisation of Palestine back in 1948 and even earlier. For convenience, as well as the perpetual perpetration of human rights violations, international institutions have enshrined their preference for ignoring and obliterating the core of the context — the creation of Israel on Palestinian territory — and influenced the world to think in the same terms. This has gone as far as a rethinking of support for Palestine, which at times fragments the struggle, with a corresponding negative effect on the ultimate aim of fulfilling the legitimate right of return. The current Israeli violence is but a part of a long colonial process which has created its own shameful history of such atrocities. That is the real context of the “violence and deteriorating situation in the Gaza Strip.” We need to challenge the ICC on this. 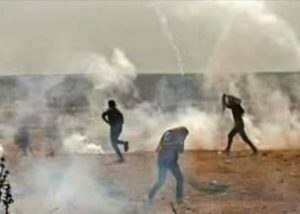 The Israeli occupation forces on Friday attacked Palestinian paramedics and a mobile clinic at the Awda (return) camp, east of Khuza’a town with heavy spates of teargas canisters on the third Friday of the Great March of Return. The Palestinian Health Ministry condemned, in the strongest terms, the assault, which it said aims to prevent medics and paramedics from evacuating wounded protesters. Over recent weeks, Israeli soldiers have frequently opened gunfire and fired teargas canisters at non-violent protesters near Gaza’s border fence, killing 34 and injuring thousands of others, including children. The Gaza-based Ministry of Health announced that hospitals and medical personnel have been on high alert as of Friday dawn to deal with the anticipated influx of casualties. Human rights groups have raised concerns about Gaza’s capacity to handle thousands of wounded in the past several weeks, highlighting the besieged enclave’s already strained resources. The Arab Organization for Human Rights (AOHR) in Britain has released a report highlighting Israeli forces’ violations against the Palestinians in the West Bank, Jerusalem and Gaza during the first quarter of the current year, 2018. According to the report, Israeli forces killed 33 Palestinians, including three minors, during the reporting period in different areas of occupied Palestine. Those victims were either killed during their participation in protests or during security campaigns in Palestinian cities, towns or villages. 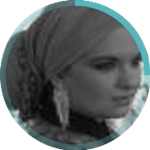 AOHR accused Israel of using lethal force when dealing exclusively with the Palestinians. Its report also pointed to the arrest of 2,055 Palestinian citizens by Israeli military and security forces during the same period. The detainees included 392 minors and 37 women from the West Bank, Jerusalem and Gaza. Despite the refusal of administrative detainees, who are held with no indictment or trial, to go to Israeli military courts for about two months in protest at their arbitrary detention, Israel has persisted in issuing or renewing administrative prison orders against Palestinians. According to the report, about 220 administrative detention orders were issued against Palestinian citizens and internees already held administratively. The former Prime Minister of Jordan, Taher Al-Masri, has called for the Palestinian Authority to be dissolved and for its leader, Mahmoud Abbas, to resign. Al-Masri explained during a seminar held yesterday at the Palestinian Centre for Policy Research and Strategic Studies in Al-Bireh, central West Bank, that dissolving the Palestinian Authority or Abbas’ resignation are the most feasible option for the Palestinians. He warned of the increasing dangers facing Jerusalem by the Israeli Judaisation plans and called to strengthen the steadfastness of the Palestinian people and their unity “especially in light of the decline of the Arab position regarding the Palestinian cause”. He also called to make every effort to end Palestinian division and achieve reconciliation. The Jordanian official praised the Marches of Return in Gaza and called for their expansion to include other parts of Palestine. The Palestinian Energy Authority yesterday stopped operations at the only power station in the Gaza Strip due to a lack of fuel to operate it. “The Energy Authority informed us this afternoon that it had stopped work at the power station because there was no fuel to operate it,” said Mohammad Thabit, director of public relations and information at the Gaza Electricity Distribution Company. “We currently have 120 megawatts per day coming from Israel after the Egyptian lines stopped working nearly three months ago. We will try with the available energy to maintain the four hour schedule, but the hours of power outage will exceed 12 hours,” he added in an interview with Quds Press. The company explained that the economic conditions and pressures will significantly affect the continued provision of services, adding that it fears that it will not be able to continue to perform its normal services. It warned that this situation will endanger every aspect of Palestinian lives in the besieged Gaza Strip and will affect the provision of other services including in the health and medical sectors. The company called on the international community and international humanitarian relief institutions to act urgently to stop the deterioration of electrical services. Israel’s right-wing Yisrael Beiteinu, led by Defence Minister Avigdor Lieberman, is pushing for a new law to punish those who document the Israeli soldiers activities during their army service, Israeli Channel 7 reported. The draft law calls for anyone who films soldiers during their military service to be handed a -year jail term which would increase to ten years if the content is classified as “detrimental to Israeli security”. The bill also prohibits the publication of video recordings on social media or disseminating them to the media. The party’s proposed draft bill comes after video footage circulated showing Israeli occupation forces cheering as their peers shot peaceful Palestinian protesters in the besieged Gaza Strip. “It is time to put an end to leftist organisations’ activities which in recent days filmed an army soldier to help delegitimize the state of Israel,” the Israeli channel quoted sources from the Yisrael Beiteinu as saying. 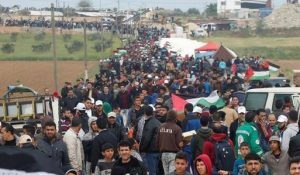 Protests have continued to take place on the Gaza border as thousands of Palestinians demonstrate for the third Friday as part of the Great March of Return. As of 4pm local time (14:00 GMT), some 350 people were injured today, adding to the over 3,000 Palestinians who have been wounded over the past two weeks. There are reports that Israeli soldiers have fired teargas at the field hospital in the east of Khan Yunis causing at least ten medics to experience suffocation. Palestinian journalist Ahmad Abu Hussein and photographer Mohammed Al-Hajjar have also been shot, adding to the growing list of reporters wounded whilst documenting the protests. Many of the protesters have burnt tyres in an attempt to hide themselves from Israeli snipers. Near Khan Yunis in the south, protesters also burned pictures of Israeli Prime Minister Benjamin Netanyahu, US President Donald Trump and Saudi Crown Prince Mohammed Bin Salman, whom they view as cooperating with Israel. Israel has deployed additional military forces to the Gaza border in preparation for planned protests since last week as part of the Great March of Return. Demonstrators are calling for the right of return for Palestinian refugees and their descendants to the homes they were forced to flee in 1948. Israeli authorities have permitted soldiers to shoot at anyone who approaches the Gaza side of the fence, despite widespread condemnation from NGOs and the UN over the practice. Last week, Israeli rights group B’Tselem appealed to Israeli soldiers to refuse any “grossly illegal” orders to fire at unarmed protesters. The Gaza Ministry of Health announced that hospitals and medical personnel were on high alert as of this morning to deal with the anticipated influx of casualties. The UN has also highlighted the region’s strained resources in delivering treatment to the wounded. “Gaza’s health sector has struggled to cope with the mass influx of casualties, due to years of blockade, internal divide and a chronic energy crisis, which have left essential services in Gaza barely able to function,” the UN agency said in a statement today. Last week’s protest was marked by the death of journalist Yaser Murtaja who was shot despite clearly wearing a vest marked “PRESS”. Photos also emerged of Israeli settlers gathering at a military watchtower to cheer as soldiers shot civilians, as well as a video of soldiers celebrating the shooting of a Palestinian protester. Israeli occupying forces are also quashing solidarity protests in the West Bank, with at least one journalist, Ramez Awwad, reportedly injured by live fire in the city of Al-Bireh. 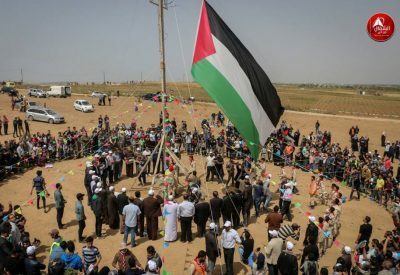 The planned six-week protest, which began on 30 March marking Palestinian Land Day, is set to end on 15 May – the 70th anniversary of the Palestinian Nakba (Catastrophe), in which more than 750,000 Palestinians were forcibly displaced by Jewish militias in 1948 to make way for the formation of the state of Israel. Update By The Health Ministry: The soldiers injured 363 Palestinians (At least 30 with live fire). 14 Medics suffered the effects of teargas inhalation. 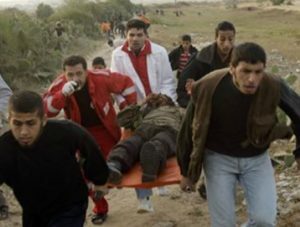 The Palestinian Health Ministry and the Red Crescent Society have reported that Israeli soldiers shot, Friday, twenty-three Palestinians with live fire, and caused dozens, including 10 medics, to suffer the effects of teargas inhalation, while protesting on their lands, in several parts of the Gaza Strip. They said the soldiers, shot seven Palestinians with live fire, east of Khan Younis, in the southern part of the Gaza Strip, before they were rushed to Nasser Hospital. Many other Palestinians, including ten medics, suffered the effects of teargas inhalation, especially when the soldiers targeted them and their ambulances with gas bombs. 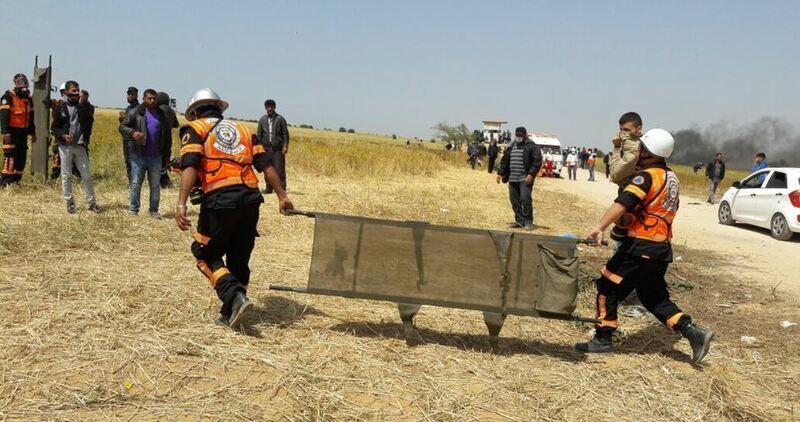 Three Palestinians were also injured with live fire, including one who suffered serious wounds, after the army opened fire on protesters north of Beit Hanoun, in the northern part of the coastal region; they were rushed to the Indonesian Hospital, in nearby Beit Lahia. Furthermore, the soldiers shot five Palestinians with live fire, near the border fence east of Jabalia town, in northern Gaza, before they were rushed to the Indonesian Hospital. In Rafah, in southern Gaza, the soldiers also attacked the protesters with live fire, wounding at least five, in addition to causing many to suffer the effects of teargas inhalation. In Khan Younis, in southern Gaza, the soldiers shot at least three Palestinians with live fire, and caused many others to suffer the effects of teargas inhalation. Dr. Ashraf al-Qedra, spokesperson of the Health Ministry in Gaza, said the number of Palestinians injured by Israeli fire and gas bombs has arrived to 112. He called on the international community to intervene, and stop the seriously escalating Israeli violations, including the targeting of unarmed protesters with live fire, the ongoing attacks against journalists and medics. Israeli soldiers shot, Friday, three young men with live fire near Gaza city, and one in central Gaza, just as the protests started on Palestinian lands, near border areas, in the besieged Gaza Strip. Update: Medical sources have confirmed that the number of wounded Palestinians, in several parts of the Gaza Strip, has reached nine. Palestinian medical sources said Israeli army sharpshooters shot three young men east of the Zeitoun neighborhood, southeast of Gaza city. They added that the three young men suffered moderate wounds, after the soldiers shot them with live rounds in their lower extremities. 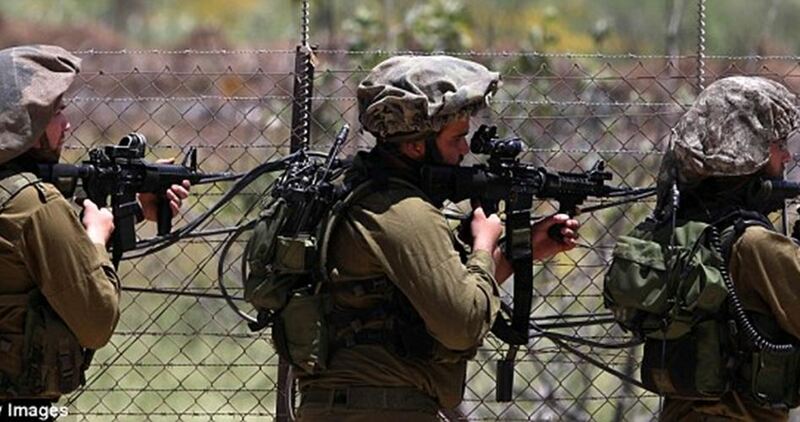 Furthermore, the soldiers shot a young man with live fire, east of the al-Boreij refugee camp, in central Gaza. The Israeli fire came just as the protesters were still gathering in many parts of the besieged coastal region, to start their popular nonviolent processions, demanding their Right of Return, and the liberation of Palestine. Israeli soldiers invaded, on Friday at dawn, Hebron city in the southern part of the occupied West Bank, Deir Samit, Beit Ummar and Beit Awwa nearby towns, searched many homes and stores, abducted four Palestinians, including three siblings, and confiscated silver. 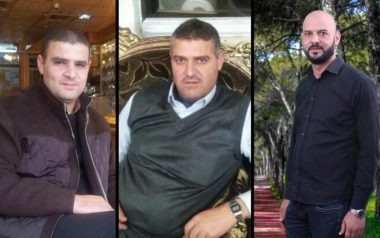 Media sources said dozens of soldiers invaded Deir Samit town, before storming and ransacking the homes of Suleiman Younis Hroub, in addition to his sons, Sameeh, Mohammad and Mousa, and abducting the three siblings. The family said the soldiers violently searched their homes and confiscated 40 kilograms of silver. In addition, the soldiers invaded homes in Beit Ummar town, north of Hebron, and abducted a teenage boy, former political prisoner Wahid Hamdi Abu Mariya, 16. The army also invaded Ethna and Beit Awwa town, and closed the main gate leading to Wad al-Yaqeen in Bani Neim town, northeast of Hebron. During the invasions, the soldiers also broke into and violently searched many stores.